Welcome to the online Computer Graphics 202 course. This class primarily uses Canvas as its learning management system and Adobe Photoshop Elements and Daz3D Bryce software as its tools for learning. You will learn these software packages while applying them to master the Elements and Principles of Art. These principles will be applied to two-dimensional and three-dimensional techniques such as painting, design, photo-manipulation, modeling and animation. General computer and internet literacy: Basic knowledge of the PC or Mac interface (opening/saving files, creating folders, creating text documents, etc.) and the internet. Internet access: A reliable internet connection (broadband recommended). Course textbook and software: Access to course material at home or another location (Center for Advanced Technology 141 MAGIC Lab, relative, friend, workplace). Online readiness: Take the MJC Online Readiness Quiz to see if you are a candidate for success in an online class. Create and alter digital images and animations using basic art and compositional concepts. The course schedule is your guide to the dates and assignment deadlines of the course. Print it and keep it at hand. We will be using the Canvas Learning Management System -- Canvas LMS -- as our conduit for online communication and learning. The Canvas LMS supports modern browsers on both PC & Mac computers and mobile platforms. Go to Canvas Supported Browsers to verify that your preferred web browser is supported. I would recommend the latest version of Firefox or Chrome as the browser for Canvas. To access Canvas, go to the MJC Canvas login page. If you are accessing Canvas for the first time, follow the instructions outlined in Signing Into Canvas for the First Time in the Canvas Sign In for Students. For a brief video tour of Canvas, go to the Canvas Overview. For additional resources for online students, go to Online Student Resources. For your assistance, there is a computer lab available to you for this course. It is sometimes less frustrating to work in an environment where you have access to all of the software, computers, and, more importantly, one-on-one assistance with the projects necessary for the course. The lab is located on the East Campus between the Gymnasium and the Student Services Building in the Center for Advanced Technology Room 141. You may contact the lab at 209.575.6140. The hours for the lab are Monday - Friday 8:30 a.m. - 5 p.m. (closed daily noon to 1 p.m) for the Fall semester. Please note that the lab will be closed on the first week of the semester, holidays and weekends. Any changes to the lab's hours will be announced in class. 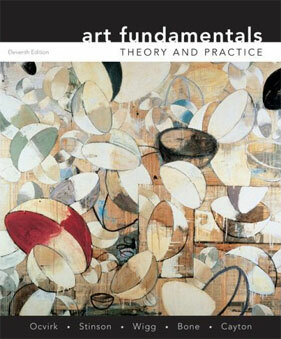 "Art Fundamentals: Theory and Practice", by Ocvick, 11th or 12th edition, ISBN 9780073526522. 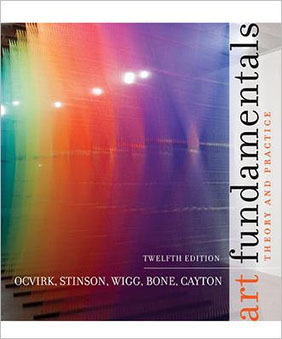 Earlier versions of the textbook (10th edition and earlier) are not recommended due to the considerable amount of changes made in the latest editions. You may purchase or rent the textbook at the Pirates' Bookstore on the MJC East Campus in the Student Center or from an online retailer (Amazon.com, Barnes and Noble). Also, the textbook is available at the following locations for checkout: East Campus Library Reserve Desk (1-day checkout (NOTE: a printout of your current class schedule is required to verify enrollment in this course)), West Campus Library Reserve Desk (1-day checkout), and CAT 141 MAGIC Lab (in-lab use only). Both software packages -- Adobe Photoshop Elements and Daz3D Bryce -- are required for this course and it is important to have access to them either on your personal computer or through an alternative means. Software installation instructions will be provided in the course's Module 1. You may purchase the Photoshop Elements software at the Pirates' Bookstore on the MJC East Campus, a nearby computer store (Best Buy, Office Depot, Staples, Costco to name a few), an online retailer (JourneyEd, Amazon), or directly from Adobe. When ordering the software, be sure to purchase the correct version for your computer (either Mac or PC). Computer software, once opened, cannot be returned! For Mac Users, versions 12-15 & 2018 work on the latest releases of Mac OS X (10.7-10.13). An earlier version of Elements (versions 6-11 ~ verify the software requirements meet your system specifcations) may be used on Mac OS X 10.4-10.6. The Bryce software may be purchased online at Daz3D Productions. If the software is purchased from the Daz3D Productions site, a Daz3D account must be created first (click the Register button at the top of the site) to avoid issues with the checkout process. For Mac Users, Bryce does not work on Mac OS 10.7 (Lion) thru 10.13 (High Sierra) due to the removal of Rosetta ~ please check your OS X version beforehand. If you are using Mac OS 10.7-10.13, an alternative means (CAT 141 Lab, relative, friend, workplace, PC, Mac Boot Camp) will be required to complete the Bryce assignments. Bryce does work on Mac OS X 10.4 (Tiger) thru 10.6 (Snow Leopard). Both Photoshop Elements and Bryce are also available on the computers in the CAT 141 MAGIC Lab for your on-campus use. Please review the MJC Student Academic Contract for Online Courses available here. Regular online participation is expected. The instructor will post announcements regarding important course topics, provide written or video feedback on coursework, and correspond through the Canvas Inbox and campus e-mail. Complete all projects, including reading and written assignments. Participate in all class activities, such as online synchronous and asynchronous discussions, and other online classroom projects including all web field trip postings. Excessive absences in these online activities may result in the student being withdrawn from the course. However, it is the student’s responsibility to drop/withdraw from the class. Instructional Drop Dates: Students who have not logged into the Canvas course and completed at least one assignment/quiz/graded discussion by 4 p.m. on Sunday, September 9 will be considered a "No Show" and dropped immediately from the course. In addition, students who have not completed at least 10 assignments/quizzes/graded discussions by 4 p.m. on Sunday, October 21 will be dropped from the course for lack of class participation. "The grading of a student’s work rests on the fundamental idea that an instructor is evaluating a student’s own work, so cheating or plagiarism demonstrates a failure to complete this most basic requirement of any course. Thus a faculty member may administer academic consequences for violating the Academic Integrity Policy ranging from partial or no credit on an exam or assignment to an F in the course. The instructor may also consider that a student’s violation of academic integrity should be a consideration for disciplinary measures, such as suspension or removal from the course or the college." The course grade is determined by the amount of points earned by the end of the semester. The maximum amount of points is 4500. 90% (4050 points) of the course grade is based on assignments, graded discussions, and quizzes. The remaining 10% (450 points) of the course grade is based on course participation, which includes general discussion postings and web field trip postings (completing all web field trips in the Discussions area will earn 450 points). Assignments, quizzes and graded discussions will be accepted late until Sunday, December 9 at 11:59 p.m. -- the maximum grade for late work will be 50%. If an assignment, quiz, or graded discussion is not completed by the late date, it will receive zero points. Assignments, quizzes, and graded discussions will not be reopened for any reason whatsoever after they are closed. Please plan your time wisely! There are several extra credit opportunities throughout the semester. It is recommended that you complete them for the purpose of giving yourself a "point buffer" should you submit late work or miss an assignment or two due to unexpected technical or personal reasons. Each module will have points assigned according to the projects submitted. How do I know my grade during the semester? It is your responsibility to calculate your grade as the term progresses. Should you like to know the total percentage at any given time, just add up the points possible, then add up your earned points. Finally, divide the possible points into your earned points. This will give you a percentage representing your current grade. (Example: 2 assignments (100 points each), 1 quiz (100 points), 1 graded discussion (50 points), web field trips posting (60 points) = 410 points. You have earned 320 of the points possible. 320/410 = .780 = 78.0%. You current grade is 78%, or a "C"). Incompletes are not an option in this course. Please consider this as the semester progresses and be aware of the drop dates listed in our course listing. For an example of grading, go to the example grading sheet. The quizzes, assignments, web field trips, extra credit, etc. will vary from semester-to-semester. The points are also an example, so please do not use this to tabulate your grade. Explore Canvas with a series of tutorials listed in the Canvas Student Guides. It is very important that you understand each area of Canvas thoroughly. Prior to the start of the course, I would recommend covering the following areas: Introduction, Global Navigation, Profile and User Settings, and Course Navigation. If you have not already, download and install the following software. Adobe Acrobat Reader allows you to read documents in .pdf format. Java runs applications and applets that use Java technology. These links will take you to examples of student work for several modules.